The Primate Research Institute sits on a hill in Inuyama, Japan, a quiet city that rambles along the Kiso River and is renowned for a 16th-century castle. Handsome homes with traditional curved roofs line Inuyama’s winding streets. The primate facility consists mostly of drab, institutional boxes from the 1960s, but it has one stunning architectural feature: an outdoor facility that includes a five-story-high climbing tower for the 14 chimpanzees currently in residence. Chimps frequently scamper to the top of the tower and take in the view; they tightrope across wires connecting different parts of the tower and chase each other in battle and play. When I walked out onto a balcony overlooking the tower with Tetsuro Matsuzawa, the head of the institute, the chimpanzees spotted us immediately and began to chatter. 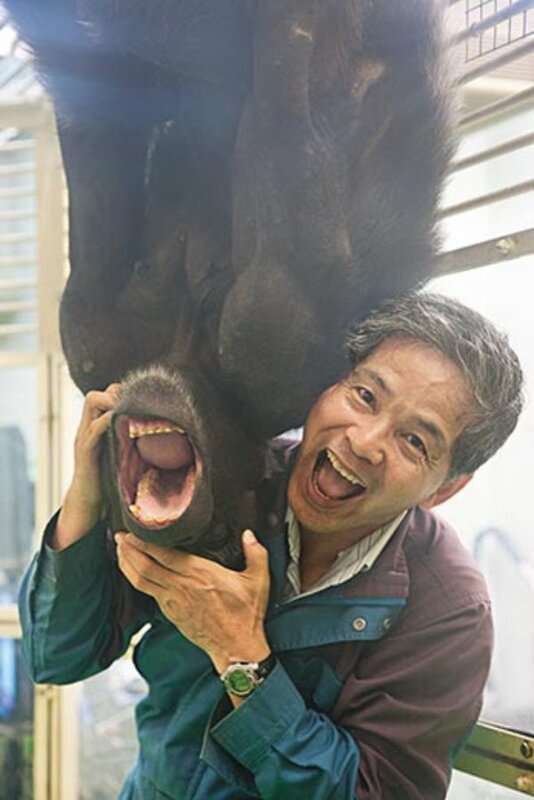 “Woo-ooo-woo-ooo-WOO-ooo-WOOOOOOO!” Matsuzawa sang out, voicing a chimp call known as a pant-hoot. A half-dozen chimps yelled back. Matsuzawa and the dozen scientists and graduate students who work with him are peering into the minds of our closest relatives, whose common ancestor with humans lived some six million years ago, to understand what separates them from us. He and his co-workers probe how chimpanzees remember, learn numbers, perceive and categorize objects and match voices with faces. It’s a tricky business that requires intimate relationships with the animals as well as cleverly designed studies to test the range and limitations of the chimpanzees’ cognition. To move them from the outdoor structure to the laboratories inside, researchers lead the animals along a network of catwalks. As I ambled under the catwalks, the chimps going into various laboratories for the morning’s experiments spit on me repeatedly—the standard greeting offered to unfamiliar humans. The lab rooms are about the size of a studio apartment, with humans separated from chimpanzees by Plexiglas walls. Following Japanese tradition, I removed my shoes, put on slippers, and took a seat with Matsuzawa and his team of researchers. The human side of the room was crowded with computer monitors, TVs, video cameras, food dishes and machines that dispense treats to the chimps. The chimp enclosures, which look like oversize soundproof booths from an old TV game show, were empty, but slots cut into the Plexiglas allowed the chimps to access touch-screen computers. Now, one of the researchers pushed a button, gates clanged and Ai entered the enclosure. Her son Ayumu (which means “walk”) went into an enclosure next-door, which was connected to his mother’s room by a partition that could be opened and closed. The institute makes a point of studying mothers and their children together, following the procedures under which researchers conduct developmental experiments with human children. Ai sauntered over to a computer screen. The computer randomly splashed numbers 1 through 7 about the screen. When Ai touched the number one, white blocks covered the other numbers. She then had to touch the white blocks in the correct numerical sequence to receive a treat, a small chunk of apple. The odds of correctly guessing the sequence are 1 in 5,040. Ai made many mistakes with seven numbers, but she succeeded almost every time with six numbers, and the odds of that happening by chance are 1 in 720 tries. Ayumu’s success rate, like those of other chimps younger than about 10, is better that Ai’s. It appears that young chimps, like human children, have better so-called eidetic memory—the ability to take a mental picture of even a complicated image—than their elders. And chimps outperform humans. 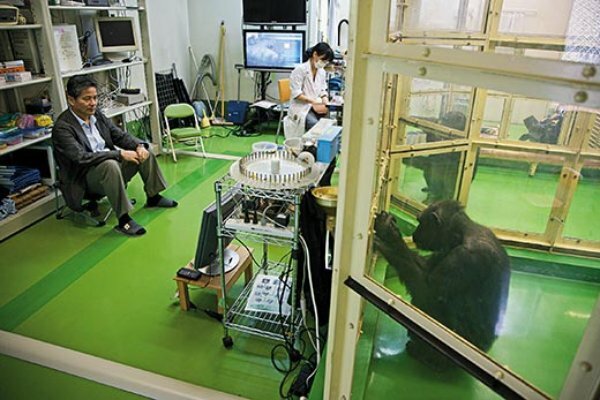 I once watched Matsuzawa show videos of his experiments with Ai and Ayumu at a conference attended by the world’s leading chimp researchers, including Jane Goodall, Christophe Boesch, Frans de Waal and Richard Wrangham. The audience gasped, oohed and aahed at the chimps’ memory skills. Ayumu next began doing a word-comprehension test known as the color Stroop task. Like his mother, he has learned that certain Japanese characters correspond to different colors. He can touch a colored dot and then touch the word for that color. But does he understand the word’s meaning or has he just learned that when he connects this symbol with that one, he receives a treat? A dog, after all, can be taught to put a paw into a human’s hand and “shake,” but, as far as we know, it has no idea that shaking hands is a human greeting. He then changed the words to Japanese characters, which I do not understand. This time I had no trouble rattling off the colors. In the Stroop test, if the chimpanzees actually understand the meaning of the words for colors, they should take longer to match, say, the word “blue,” when colored green, to a green dot. So far, Matsuzawa told me, preliminary data suggest the chimpanzees do, in fact, understand the meaning of the words. Despite Matsuzawa’s precision, some people in the field caution that his experiments can fool us into granting chimpanzees mental faculties they do not possess. Other researchers found that they could perform as well as Ayumu on the numbers test if they practiced enough. And while no one disputes that Ai can sequence numbers and understands that four comes before five, chimp researcher Daniel Povinelli of the University of Louisiana at Lafayette says that feat is misleading. Unlike young human children, Ai, Povinelli contends, doesn’t understand that five is greater than four, let alone that five is one more than four. Ai—in Povinelli’s estimation “the most mathematically educated of all chimpanzees”—has never had that “aha” moment. As fascinating as it is to watch Ai and Ayumu working the touch-screen computers, I was even more struck by Matsuzawa’s interactions with the animals. Once, watching Ayumu, I leaned against the Plexiglas to take some photographs. I was not using a flash and thought I was being discreet, almost invisible. But Ayumu jumped up, stretched his arms in display, smacked the Plexiglas and spit at me. He stood just inches from my face. “Stay right there, please,” Matsuzawa said to me. I was completely safe, but still frightened by Ayumu’s raw power. As I sat frozen, trying not to react to the serious stink-eye from Ayumu, Matsuzawa slipped a jumpsuit over his clothes and a pair of thick gloves over his hands. With his race car attire in place and what looked like a bathroom scale tucked under one arm, he headed toward an entrance to the chimp enclosure. His staff hit buzzers, and a series of metal gates groaned open, allowing him to enter the booth. Ayumu came right over to him. “Sit,” commanded Matsuzawa, in English. “Be good boy.” He pointed to Ayumu and also spoke to him in Japanese. Ayumu took a seat. Matsuzawa and Ayumu played a nonverbal imitation game, with the chimp touching his lips, patting his head and opening his mouth in response to Matsuzawa’s cues. At one point, when Ayumu realized he was not going to get a treat, he jumped up, and I was convinced he was going to bite Matsuzawa. But Matsuzawa slapped his back and took control, bulleting him with commands to sit, lie down and even climb the wall, each of which Ayumu dutifully obeyed. Then they rolled around on the ground together, wrestling, until Matsuzawa, tired, just flopped into a prone position and rested. When they were done playing, Matsuzawa weighed Ayumu and checked his teeth. He then turned and did the same with Ai. He wiped the floors with paper towels to collect samples of their urine, which he’ll use to study hormonal levels. 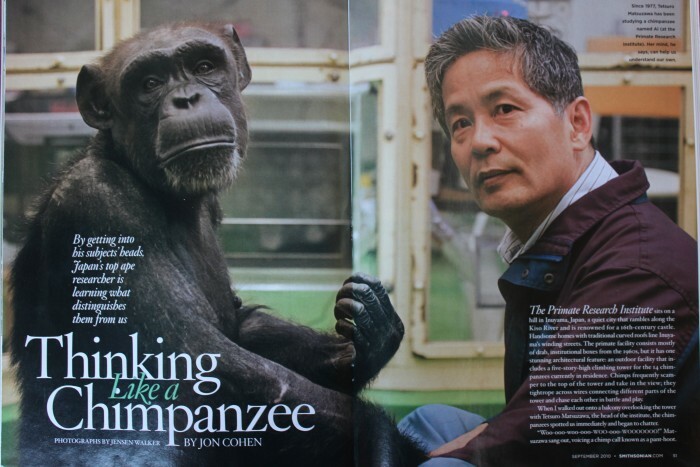 “For 30 years I’ve been with chimpanzees in the same room, and I still have ten fingers,” Matsuzawa deadpanned. At his field site in West Africa, he has studied everything from the animals’ social dynamics to their feces (to understand the microbes that live in their intestines). He has focused on a capability that many researchers believe highlights a core difference between chimps and us: how they learn to use tools. To crack nuts, chimps set up a stone anvil, place a nut on it and then smash it with a second stone used as a hammer. Matsuzawa, his former postdoctoral student Dora Biro of Oxford University and others have found that wild chimpanzees at Bossou do not teach the complicated behavior. The definition of “teaching” is a bit fuzzy, but it requires that three basic conditions be met. The action must come at some cost to the teacher. There must be a goal. And the teacher must use some form of encouragement or disapproval. In Bossou, younger chimpanzees learn how to crack nuts simply by watching. This “master-apprenticeship” education, which Dutch primatologist Frans de Waal has compared to the way students learn to cut sushi after years of observing master chefs, means that chimpanzee adults do not reward their young when they do something the right way or punish them when they make a mistake. The young learn through trial and error. Chimps eat nuts wherever they find them and wherever they have stones handy, which can make observing the behavior a matter of luck—especially in the forest, where it is often hard to see beyond a few yards. So in 1988 Matsuzawa created an outdoor laboratory in Bossou that has allowed his team to watch hundreds of hours of nut-cracking at close range. For a few months each year, the researchers place numbered stones of specific weights and dimensions on the ground and provide the chimps with piles of oil palm nuts. Then they hide behind a grass screen and watch the site from dawn to dusk, videotaping all chimpanzee visits. If teaching occurred, they would likely have seen it. A few years back, he developed a theory about a fundamental difference between chimpanzees and us that might be at the root of human language. The story starts with a simple gaze. Monkeys rarely look into each other’s eyes; what is known as a “mutual” gaze is usually read as a sign of hostility. Many scientists thought that affectionate eye-to-eye contact was uniquely human—until Matsuzawa and his colleagues put it to the test with chimps. The birth of Ayumu and two other babies at the Primate Research Institute in a five-month span in 2000 gave Matsuzawa the opportunity to observe mother-infant pairs intensely. The scientists learned that new mothers looked into the eyes of their babies 22 times per hour. And chimp babies, like human infants, communicate by imitation, sticking out their tongues or opening their mouths in response to similar adult human gestures. Because chimps and humans engage in this distinctive behavior but monkeys do not, Matsuzawa asserts that the common ancestor of chimps and humans must also have made eye-to-eye contact between mother and infant, thereby setting the stage for humans to develop our unique language skills. Humans introduced a twist in this evolutionary tale. Chimpanzee babies cling to their mother. But our babies do not cling; mothers must hold their infants or they will fall. It may seem like a small difference, but it changes the way adults and infants interact. Because human mothers separate themselves from their babies, human babies have to cry to get attention. “Not many people recognize the importance,” he says. “Human babies cry in the night, but chimpanzee babies never do because mother is always there.” This crying is a proto-language of sorts. Add to this the fact that humans are the only primates that can lie on their backs without having to stabilize themselves. Chimpanzee and orangutan infants have to raise one arm and a leg on the opposite sides of their bodies to lie on their backs. They must grasp something. Human babies can stably lie in the supine position, allowing easy face-to-face and hand-gesturing communications to let others know what they’re thinking or feeling. “All of these things are interconnected, and from the beginning,” Matsuzawa says. “The underlying mechanism of communication is completely different between humans and chimpanzees because of the mother-infant relationship.” Though Matsuzawa’s theory is difficult to test, it’s logical and alluring. “What is the definition of humans?” he asks. “Many people say bipedal locomotion. Decades ago, they said it’s language, tools, family. No. Everything is incorrect. My understanding is the stabile supine posture, that is completely unique to humans.” Muscles, he says, shaped our minds. The list of differences between humans and chimpanzees is long, and the most obvious ones have received intense attention from researchers. We have bigger and more complex brains, full-fledged language and writing, sophisticated tools, the control of fire, cultures that become increasingly complex, permanent structures in which to live and work, and the ability to walk upright and travel far and wide. Matsuzawa and his colleagues are clarifying more subtle—but no less profound—distinctions that often are as simple as how a chimpanzee learns to crack a nut or how a human mother cradles her infant, rocks it to sleep and lays it down for a night’s rest. Jon Cohen wrote about stem cells for Smithsonian in 2005. Jensen Walker is a photographer based in Tokyo. Adapted from the book Almost Chimpanzee: Searching for What Makes Us Human, in Rainforests, Labs, Sanctuaries, and Zoos by Jon Cohen, published this month by Times Books, an imprint of Henry Holt and Company, LLC. Copyright © 2010 by Jon Cohen. All rights reserved.